Art With Mr. E: Question: What kind of glue works best for sequins?? Question: What kind of glue works best for sequins?? So this next week my 2nd graders are going to be adding to their tint & shade robots﻿. I'm going to allow them to use some metallic paint & sequins to give 'em a little bling bling. However, when I've used sequins in the past...it just hasn't worked out very well. I would allow the students to attach the sequins with Elmer's. However...they'd so easily pop off after the glue dried. What works best for you? Aleenes Jewel It! 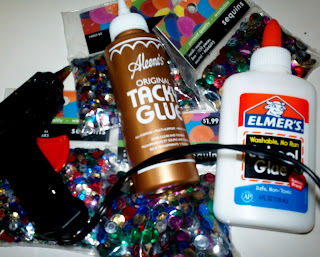 is my fav for attaching sequins and beads. It dries kind of rubbery so it flexes with the sequin. Not hard and plastic like elmers which makes it pop off. Good luck. I'd say hot glue- but if you are using sequins- beware of your fingers. My second choice would be tacky glue. You are right, elmers and sequins isn't always the best. Good luck- and if you go with the glue gun, have some toothpicks, or a popsicle stick handy to push the parts down, and save your fingers. Tacky Glue ALL THE WAY! I used Tacky glue for anything other than paper at my last job, where we could afford it! But yeah- go for the tacky, that way it sticks and the students can do it themselves. Tacky or some sort of fabric glue would be my choices, though I don't have much sequin/paper experience. Another vote for Aleene's Tacky! It's the bomb! I put it in mini cups for the kids- they can dot it on with a toothpick...or just let them go for it with the bottle. I find that the bottles can clog and kiddies usually squeeze too much- that's why I recommend they do several dot-dot-dots with the picks. You can add a VERY tiny bit of water to make it not so tacky, but do not add too much or it loses it's wow factor. I find that if elmers, is left out for a couple hours, it becomes more like tacky glue. There it works better. I like tacky PVC glue best because it is flexible when it sets and doesn't let the sequin crack off like elmer's glue.